Welcome our our special gallery featuring this beautiful “coastal contemporary” home renovation by Krista Watterworth Design Studio. You may be already familiar with Krista Watterworth from her acclaimed shows on HGTV, Save My Bath and Splurge & Save. 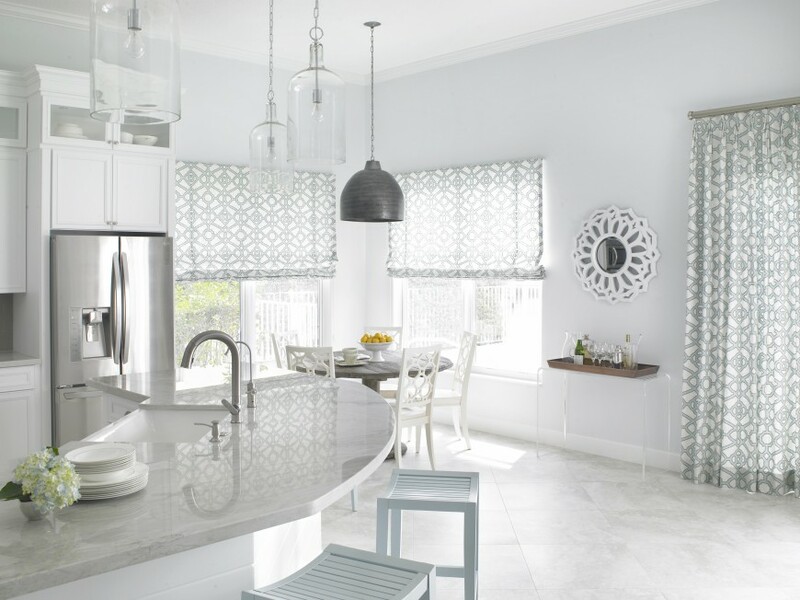 Krista Watterworth’s designs have been featured internationally, and her design studio in Palm Beach County specializes in a fresh and current design style, one that is simple, straightforward, and functional but also alluring. This featured home is located in Palm Beach Gardens, Florida and is on the intracoastal waterway. The clients are a young boating family who wanted to update their dark, outdated, and uninviting home to a chic, coastal look–but without the kitsch. The home itself is 3500 square feet, with four bedrooms and four bathrooms. The resulting design is a beautiful, light and bright mixture of seaside sophistication and rustic barnyard. Krista Watterworth updated the color palette of vanilla and cool aqua with warm, yet light fabrics like cotton and linen. Airy hand-blown glass fixtures make appearances throughout the home, along with shiplap siding. The living room presented a bit of a design problem; the room has many focal points, including the television, a fireplace, and a gorgeous view of the water, so the furniture had to be arranged in a way that didn’t exclude any of these, and still kept the open feel of the home. The result is a gorgeous, polished and contemporary family home that acknowledges the coastal location without overdoing it. We hope you’ll enjoy this bright, airy, and contemporary family home as much as we have! Curb view of sophisticated coastal contemporary home by Krista Watterworth with brick driveway. The home office is a light, airy space that promotes creative thinking. The blue velvet settee has a coordinating tufted ottoman that adds visual interest and warmth to the light color palette. A moroccan mirror hangs above the settee. The multiple patterns create a layering effect, rather than clashing. The simple desk is rustic, yet elegant, and a simple sketch adorns it, along with a small lamp and a glass paper weight. A glass vase with calla lilies is another perfect touch. The light and bright kitchen is awake and yet relaxing. The eat-in bar has powder-blue wooden stools. In the corner with the windows is a small breakfast nook that looks out on the water. The white dining chairs are matched with a more rustic circular table. A small bar area is in a wooden tray that appears to float, when in reality it sits on a delicate transparent glass table. 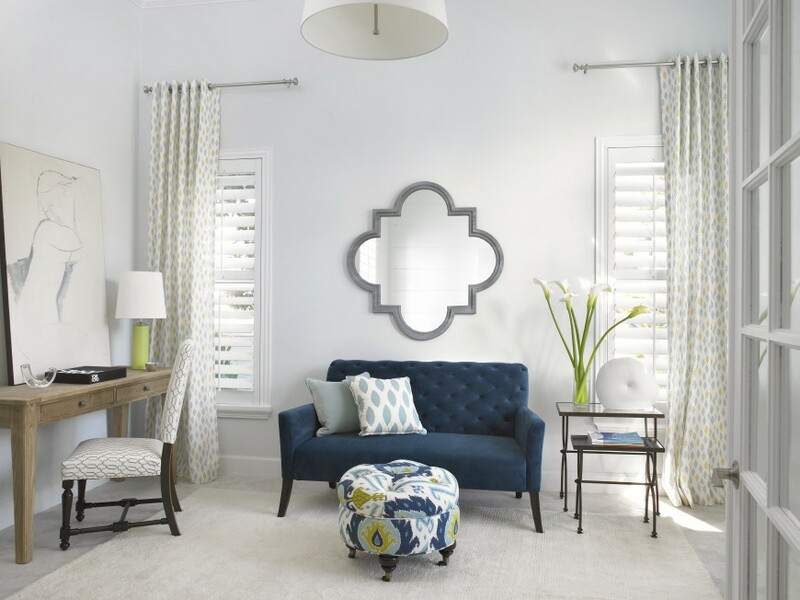 The patterned curtains and matching roman shades add a spark of color into the white area. This view of the kitchen shows the cooking area, with darker subway tiles in the backsplash. 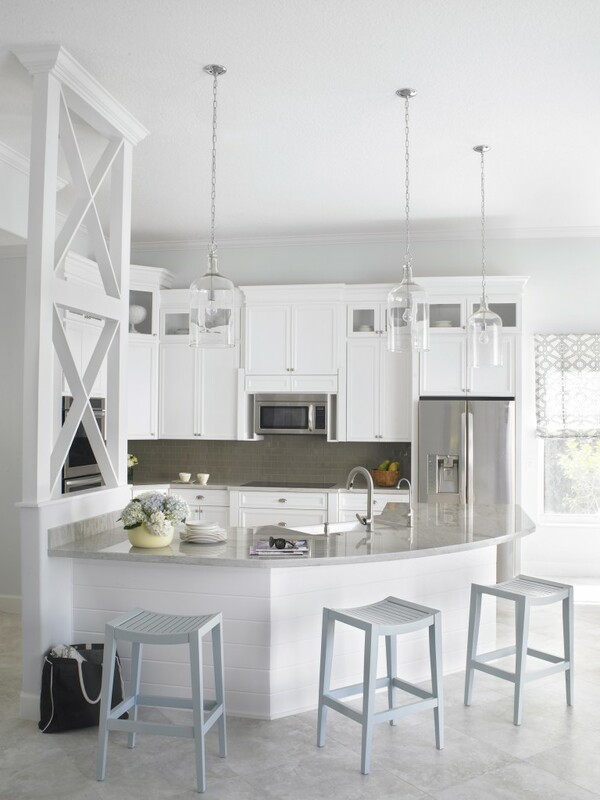 The kitchen island is shiplap painted white to match the rest of the kitchen. Separating one end of the bar and the work area is an elegant dividing wall with rustic charm. Glass pendant lights hang above the kitchen island. The master bedroom has light hardwood floors and matches a light bench, dark nightstand, and white headboard for a coastal feel. The area rug adds texture, and the layered patterns in blue and gray add to the coastal feeling. The glass double doors lead out onto a small balcony that overlooks the owner’s boat. 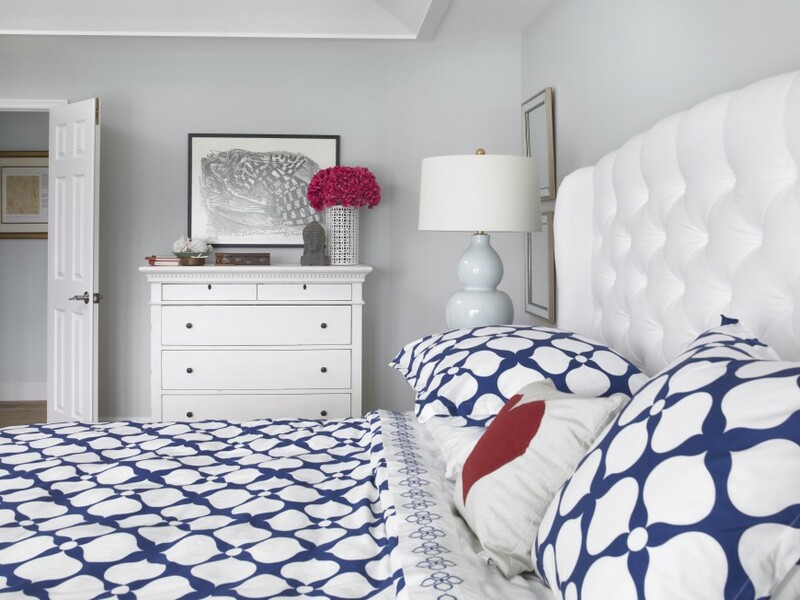 A close up of the bedding shows the button-tufted headboard, the bright, large pattern of the bedding, and the small dresser to the left of the bed with bright accents. The master bathroom is cool and relaxing, with dove-gray cabinets, his-and-hers sinks separated by a towel shelf, and a deep soaking tub near the windows. A large glass-enclosed shower is on the left. Small floral accents brighten the space. The play room is full of bright, fun colors, and the rug is emblazoned with an anchor. There is plenty of storage against the back wall for toys and games. The walls are in ultra-thick stripes, and decorated with paddles in blue, white, and red. The elegant living room is open to the kitchen and breakfast nook. Layered patterns in shades of blue make another appearance here in the ottoman, reading chair, and the accent pillows on the cream sofas. A tray with spring and coastal accents effectively makes the ottoman into a coffee table. The enclosed fireplace has a gold floral mirror above it. A sliding barn door painted white leads into the playroom. The beautiful view includes the water, palm trees, and lots of greenery.